The design and construction of EESeal® FilterSeals makes them easy to install by hand, without special tools, but care is needed to ensure proper insertion. Not the right connector type? View instructions for DSub Connectors or MDM Connectors. The side with the EESeal® logo is facing up and is visible after the EESeal® is inserted. 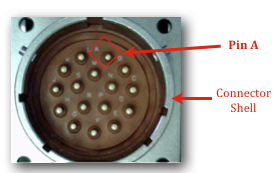 With the correct side up, orient the EESeal® so its pinholes roughly align to the corresponding pins in the host connector. Most EESeal® FilterSeals have at least pin A (or pin 1 if your connector has numbers) marked to assist you in this orientation. 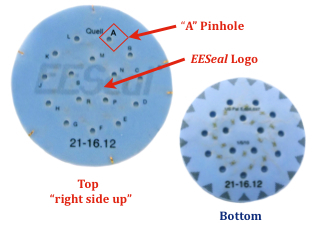 Important Note: It is imperative that the EESeal® be inserted so its pinholes are aligned with the matching pins in the connector – pin A to pin A, or pin 1 to pin 1, and so on. Your EESeal® may have a different treatment for each pin, and proper orientation will ensure each pin gets the correct circuit connection. Slightly cup the EESeal® so that Pinhole A (or pin 1) can be easily slipped onto the corresponding pin in the host connector. Double-check that the corresponding EESeal® pinholes are going over the correct pins in the connector. Gently use your fingertip to push the EESeal® down just over the tip of the pin, no further. 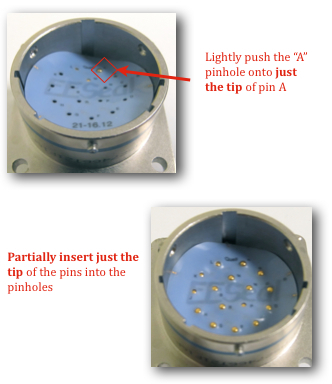 Now simply press the rest of the pins into the EESeal® pinholes in the same manner. To make the EESeal® go on easily, notice that the EESeal® is intentionally oversized, so your pressing action should be towards (not away from) the pins already completed. Do not attempt to push the EESeal® down any further than just over the tip of the pins. First, confirm that you can see the tip of each and every pin slightly poking through its corresponding EESeal® pinhole (if not, complete step 3 before proceeding). The EESeal® can be fully inserted and permanently seated by simply mating the connector pair. Do not use your finger or any tool to seat the EESeal®, doing so may cause damage to the EESeal®. Now check the EESeal® to ensure it is flat at the bottom of the connector, with no folds along its edge or interior. It should appear like it belongs there. If you notice anything unusual, please contact us.